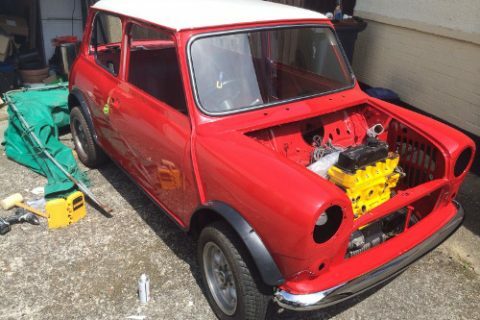 Building your own mini classic can be very rewarding. Trust me I know, because I have done it! 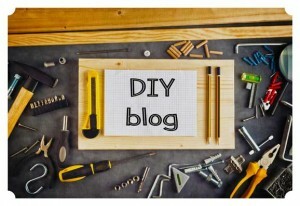 My name is Jon, I am the owner of this DIY Blog. I have a deep interest in cars, and loved the idea of building one from scratch. 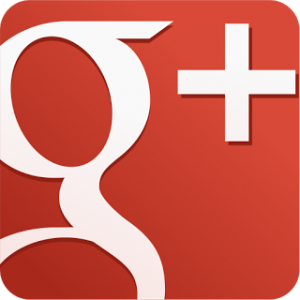 This post will go through my achievements and challenges. First of all I want to tell you some history about the mini cooper classic, and why I believe it to be special. The mini cooper classic was an extremely innovative vehicle for its time, and an icon of British history. They were manufactured by the British Motor Corporation (BMC), dating back to the 1950’s. 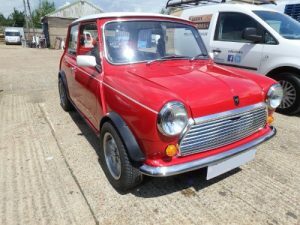 The classic mini design was based upon it being a budget car. Although it offered just the basics, its unique design made this a fun and stylish car to drive. Everyone had them. From working-class families to the likes of celebrities. To this day the classic mini appeals to British car enthusiasts, racers, collectors, and micro-car fans. 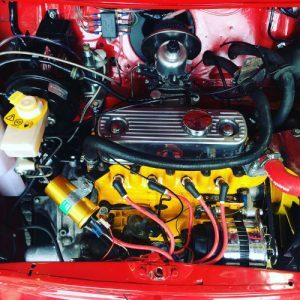 I am a car enthusiast who wanted a relatively simple car DIY project. Building your own mini classic seemed to be the perfect choice. To my surprise this the project slowly began to consume my life. Do not be fooled by its size, it can be more work than you think. But totally worth it! When building your own mini classic, high quality parts are essential. I have also tried my best to ensure it looks like the original. 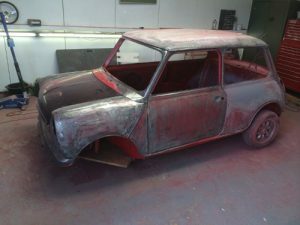 If you wish to know my experience in building such a car, then read on. Check Mate: Consists of a black and white roof. Flame Red: Has a red and white roof. Racing Green: Consists of a green and white roof. 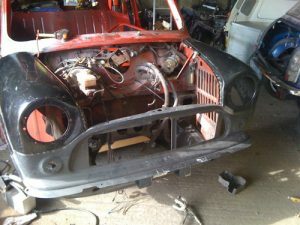 Having a good chassis is critical when building your own mini classic. After all, this is the first thing people will see. When looking for a chassis I tried to select one with few rust patches as possible. One chassis in the image below is what I started with. There were various rust patches around the chassis. I managed to clean up this rust easily with a flap disk on the grinder. I did not modify the chassis as I wanted it to match the original. Only two small areas required welding. 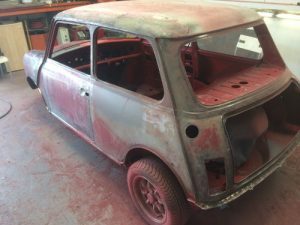 The chassis was taken to a professional paint shop, where it was prepped prior to receiving a bare metal re-spray. 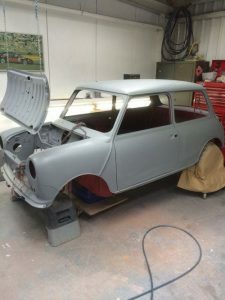 This included spraying of the wheel arches and inside the bonnet. 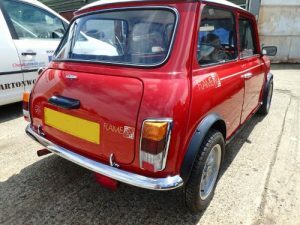 The colours were selected to replicate an original flame red 1989 mini. I then added decals and badges, which consists of a ‘Flame’ logo. It was important to me that the engine works smooth as possible, and looks immaculate. I first started by replacing the cylinder head and gasket. Getting the engine to run smoothly took many days to get right. I eventually achieved this by replacing my Lucas 45D mechanical points ignition distributor for an electronic ignition system with NGK spark plugs. This resulted in more reliable spark timings. Another critical component that needed changing was the HIF38 carburettor. It is important to change these because they are made up of different parts, which can become inefficient. H stands for Horizontal, and IF means Integrated Float. The 38 is the width of the throat in millimetres. My old carburettor was worn, which means it was no longer the optimum dimensions it was manufactured to, leading to engine combustion issues. 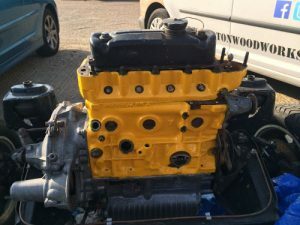 Airflow and filtration was improved by installing a new air filter manufactured by K and N. This helped to increase horse power and acceleration. A new aluminium radiator was installed to ensure the new refurbished engine gets the cooling it needs. In-fact the new radiator is superior to the mini original for that model. Once the whole car and powertrain had been assembled, the engine was expertly tuned. I fitted original mini copper front calipers, disks and pads. Along with new rear cylinders and shoes. I then bled new fluid throughout the system. I also fitted new bushes and pins in the pedal box and servo arms. I installed kyb shock absorbers all round. I have replaced both track rod ends, the rack gaitors and the upper bush in the column. It has an average condition set of 12″ rover minilite wheels on it with locking nuts and brand new Yoko A539 tyres. I fitted original black ‘crayons’ fabric seats and door cards, almost in perfect condition. Also installed were cobra bucket seats and a radio cassette. The trim was from Newton commercials interior. Exterior trim consists of Chrome bumpers and a black grille center. Wheel trims are full-width white. New window seals were installed. They haven’t been made for a long time and won’t ever again. As such, there value is ever increasing. As more and more Classic Minis are scrapped, yours will become more valuable. Therefore, it is essential you look after your revamped mini to help protect your investment. Personally, I keep mine in a garage, no matter what the weather. 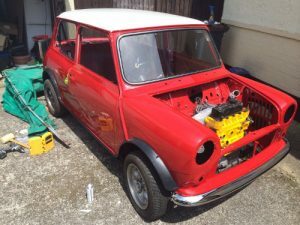 Hopefully the above tips are helpful when it comes to building your own mini classic.